At the New England Water Environment Association (NEWEA) Annual Conference in Boston last month, WhiteWater service technician, Brandi Madden, was a featured panelist in a workforce development session aimed at attracting the next generation to the water quality profession. The panel entitled, “Veteran Engagement – NEWEA Water Warriors” was held on Tuesday, January 23, 2018 at the Boston Marriott Copley Place. 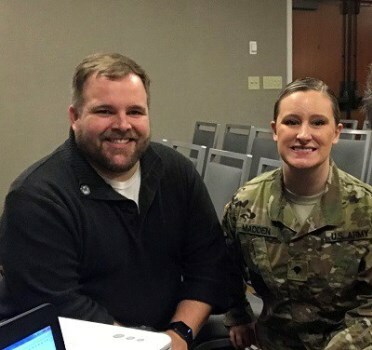 Water Warriors Initiatives is a joint effort by NEWEA and its Affiliated State Associations to recruit and retain returning and retiring U.S. Armed Forces veterans into the drinking water and clean water infrastructure fields. Many skills learned in the Armed Forces, particularly with equipment maintenance and science-based programs, translate well into a successful career protecting the one thing no one in our country can live without – clean water. At the same time, many of our most qualified water/wastewater operators are reaching retirement age, leaving the industry with a labor shortage, not to mention the imminent loss of decades of institutional knowledge. The Water Warrior Initiative seeks to tackle these two problems by promoting the water/wastewater field as a desirable career option for returning veterans. Ms. Madden is a water purification specialist in the 125th Quartermaster Company with the Massachusetts Army National Guard and serves as the unit’s retention non-commissioned officer and career counselor. At WhiteWater she works in the compliance and operations support group predominately on drinking water; helping improve productivity and effectiveness to better serve our customers. Following the panel discussion, she joined Dustin Price, Maintenance Manager at the Portland (ME) Water District, for a Words on Water podcast where they discussed the value that military veterans bring to any workforce and water sector jobs in particular; and share their stories of moving from the military to water jobs. Words on Water is a program of the Water Environment Federation (WEF) that features conversations with influential and interesting people who work in the water sector. Through these conversations, topics explore infrastructure, innovation and technology, resource recovery, workforce, research and public awareness. To listen to the podcast on Veterans Working in Water visit https://wordsonwaterwef.com/. The New England Water Environment Association is a dynamic organization of over 2,100 highly qualified and motivated water and wastewater professionals located throughout New England, who volunteer their time, energy, and expertise to preserve, protect, and manage one of our most precious resources here in New England, our water environment. Members contribute to “the friendly exchange of information and experience.” As a volunteer organization, NEWEA exists solely because of the involvement and contribution of each member. The Water Environment Federation is a not-for-profit technical and educational organization of 34,000 individual members and 75 affiliated Member Associations representing water quality professionals around the world. Since 1928, WEF and its members have protected public health and the environment. As a global water sector leader, our mission is to connect water professionals, enrich the expertise of water professionals, increase the awareness of the impact and value of water, and provide a platform for water sector innovation. To learn more, visit www.wef.org. © 2019 WhiteWater Water & Wastewater Solutions. All Rights Reserved. Website Design.